Bhutan's early history is steeped in mythology and remains obscure. Some of the structures provide evidence that the region has been settled as early as 2000 BC. According to a legend it was ruled by a Cooch-Behar king, Sangaldip, around the 7th century BC, but not much is known prior to the introduction of Tibetan Buddhism in the 9th century, when turmoil in Tibet forced many monks to flee to Bhutan. In the 12th century, the Drukpa Kagyupa school was established and remains the dominant form of Buddhism in Bhutan today. The country's political history is intimately tied to its religious history and relations among the various monastic schools and monasteries. Zhabdrung was a title used when referring to or addressing great lamas in Tibet, particularly those who held a hereditary lineage. In Bhutan the title almost always refers to Ngawang Namgyal (1594–1651), the founder of the Bhutanese state, or one of his successive reincarnations. Gongsar Ugyen Wangchuck was the first Druk Gyalpo from 1907–1926. In his lifetime he made great efforts to unite the country and gain the trust of the people. Penlop is a Dzongkha term roughly translated as governor. Bhutanese penlops, prior to unification, controlled certain districts of the country, but now hold no administrative office. Rather, penlops are now entirely subservient to the House of Wangchuck. Penlop of Trongsa, also called Chhoetse Penlop, is a Dzongkha title meaning "Governor of the Province of Trongsa (Chhoetse)". It is generally given to the heir apparent of the Kingdom of Bhutan. The most recent holder of the title was King Jigme Khesar Namgyel Wangchuck, who was then a prince. Although the current heir presumptive is Prince Jigyel Ugyen Wangchuck, the title is reserved for the officially designated heir apparent, which is subject to change by the reigning king. Also, the reigning Druk Gyalpo may retain the office or award it to another person after coronation. The proper reference style is His Royal Highness Trongsa (Chhoetse) Penlop. Dzongpen is a Dzongkha term roughly translated as governor or dzong lord. Bhutanese dzongpens, prior to unification, controlled certain areas of the country, but now hold no administrative office. Rather, dzongpens are now entirely subservient to the House of Wangchuck. Trongsa Province was one of the nine historical Provinces of Bhutan. Paro Province was one of the nine historical Provinces of Bhutan. Punakha Province was one of the nine historical Provinces of Bhutan. Wangdue Phodrang Province was one of the nine historical Provinces of Bhutan. Daga Province was one of the nine historical Provinces of Bhutan. Bumthang Province was one of the nine historical Provinces of Bhutan. Thimphu Province was one of the nine historical Provinces of Bhutan. Kurtoed Province was one of the nine historical Provinces of Bhutan. Kurmaed Province was one of the nine historical Provinces of Bhutan. The Provinces of Bhutan were historical regions of Bhutan headed by penlops and dzongpens. Provincial lords gained power as the increasingly dysfunctional dual system of government eventually collapsed amid civil war. The victorious Penlop of Trongsa Ugyen Wangchuck gained de jure sovereignty over the entire realm in 1907, marking the establishment of the modern Kingdom of Bhutan and the ascendancy of the House of Wangchuck. Since this time, the provinces of Bhutan have been reorganized several times into what are now the twenty Districts of Bhutan (Dzongkhag). 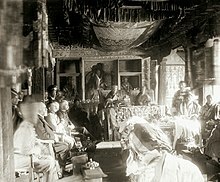 Provincial titles such as Penlop of Trongsa and Penlop of Paro carry on, however, wholly subordinate to the Royal House. Desi Jigme Namgyal of Bhutan is a forefather of the Wangchuck Dynasty. He served as 48th Druk Desi of Bhutan (1870–1873), and held the hereditary post of 10th Penlop of Trongsa. He was called the Black Ruler. Jetsun Pema is the queen consort of Bhutan, as the wife of King Jigme Khesar Namgyel Wangchuck.